Former Peruvian President Alberto Fujimori has arrived home after extradition from Chile to face charges of human rights abuse and corruption. Hundreds of supporters were waiting at a police base in Lima but his plane landed at a nearby military air base. The ex-leader denies the allegations, which date back to the early 1990s, and has fought extradition since 2005. But after the Chilean decision, he said the extradition would give him an opportunity to clear his name. 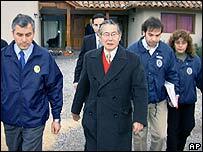 After landing, Mr Fujimori was taken to a police detention centre some 30km (19 miles) outside the capital. It had been expected that the plane carrying Mr Fujimori from Chile would land at a police base near the capital's main airport, but it went to the military air base instead, flying over the heads of hundreds of supporters who had been waiting to greet him. The BBC's Dan Collyns in Lima says Mr Fujimori is a very controversial figure in Peru, arousing strong passions, both for and against. He is popular with many working-class Peruvians, who say current President Alan Garcia ruined the economy in his first term of office, before Mr Fujimori's election in 1990. The legal process Mr Fujimori now faces is unlikely to be swift, our correspondent says. Mr Fujimori said in a radio interview before his departure from Chile: "I am certain and secure in addressing the actions of my government in this trial and will emerge with honour." Mr Fujimori's daughter Keiko, who leads his political movement in Peru's Congress, called for his supporters to rally round and give him the reception a former head of state deserved. Chilean Supreme Court judge Alberto Chaigneau said the court's extradition decision had been based on two charges of human rights violations and five of corruption. Peruvian Prime Minister Jorge del Castillo said his government would not politicise the case and pledged that Mr Fujimori would be given a fair trial and treated with dignity. The human rights charges against the former Peruvian leader date back to the early 1990s, when his government was allegedly responsible for killing civilians in the fight against Shining Path Maoist guerrillas. One of the alleged massacres was at a poor neighbourhood in Lima in 1991 in which 15 people died. The second at a dormitory at La Cantuta University in 1992 in which one teacher and nine students were abducted and killed. In his first interview after the ruling, Mr Fujimori told Peruvian radio that he had always tried to do what was best for the country. "I governed Peru for 10 years, through one of its worst periods, and solved most of the problems the country faced such as terrorism and hyperinflation." However he acknowledged that "some crass errors" had been made by his administration. 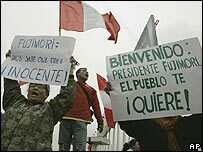 Mr Fujimori - the son of Japanese immigrants - led Peru from 1990 to 2000, and fled the country as his term in office drew to a close amid a corruption scandal. He initially flew to Japan, where he holds dual nationality and is immune from extradition. Five years later he travelled to Chile in a failed attempt to return to Peru to run in last year's presidential elections.